Best Beer – I tasted many and disliked few, so this was a tough call. When it came down to it though, I couldn’t decide between the Ballast Point Sculpin and the Craft Brewing Co. Raven Stout. Completely different beers obviously, and each @ the top of their class. Best Tchotchke – Maybe I missed a booth or two (a crime if so), but Sierra Nevada was offering up a nice looking key ring bottle opener that takes the prize. That being said, there were way to many business cards and stickers and not enough “useful” freebies. My beer glass doesn’t fit on your business card, gimme’ a bar coaster with your logo! Best Music – Without making any disparaging remarks about the KROQ entertainment, anytime the pipes are present they steal the show. The Orange County Fire Authority Pipes and Drums closed the event with style. 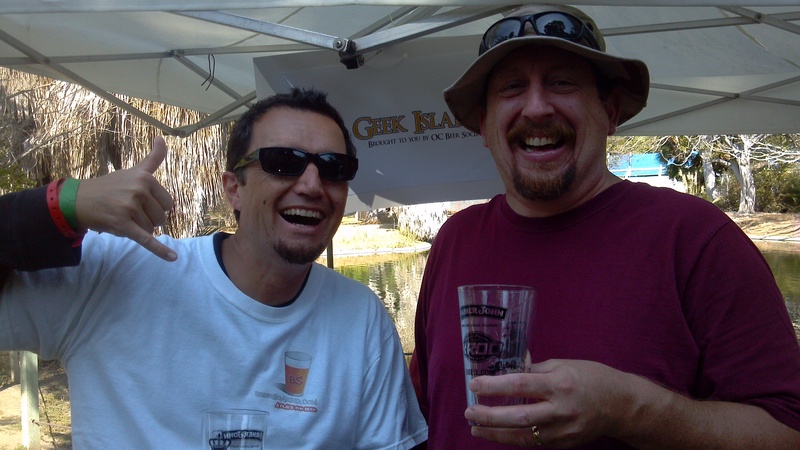 Coolest “Event” – No contest, Beer Geek Island. This was like another beer tasting @ the beer tasting! The nice surprise was that the beer snobs broke out the good stuff to share. Except for whoever brought that coffee beer. C’mon, really? Quote of the Day – A fine gentleman with whom I am familiar exclaimed for no apparent reason that if it was 20 years ago, he would be “wreckin’ some hos”. I am still not sure if this exclamation was the result of beer consumption or him feeling emasculated as he had a very large sausage in his mouth at the time. In either case ladies, consider yourselves lucky that it’s not 1991. Best Surprise – The people. A great eclectic mix that really did behave themselves. The douchebaggery was @ a minimum, even in the restrooms. No line cutting, no peeing in the sinks or trashcans. Nice going people, you’ve increased my faith in humanity by a pint. Worst Surprise – No shows. I know there were quite a few of us looking forward to Russian River and Dogfish Head but neither brewery made it. I was so upset that I had to come home and open a Pliny to dull the pain. All in all a great day shared with great people for a great cause. Oh, and beer. There was beer. This entry was posted in Craft Brew, Events, Tasting by Scott. Bookmark the permalink. Nice Scott, Thanks for posting that video of the pipers! I don’t know how Kevin evaded the camera all event. I’ve heard of camera shy, but come on…. he wasn’t even in one photo. Next time I’m bringing the camera, and taking pics of everything. For me the Best Beer was the Bruery’s Autumn Maple, Best Swag was at the Noble Ale Works booth: stickers, tattoos, and heavy pours of Imperial Stout, Best Music was definitely the bagpipes, Coolest Event was a tie between Dr. Bill’s opening speech, and the Island of misfit beers, Quote of the day was “Today, this year, we are living in the greatest time for beer drinkers in the history of the world.” – Dr. Bill Sysak (Stone Brewing), Best Surprise was that Dogfish Head was actually at the event and being poured off the back of the 30 foot fire engine for those who found it. Worst Surprise was that I didn’t find that out until the day after the event.